Since you’ve made it to this post, I’d assume you already have a pair of great snowshoes. Now all that’s left is getting prepared for the real winter adventure. 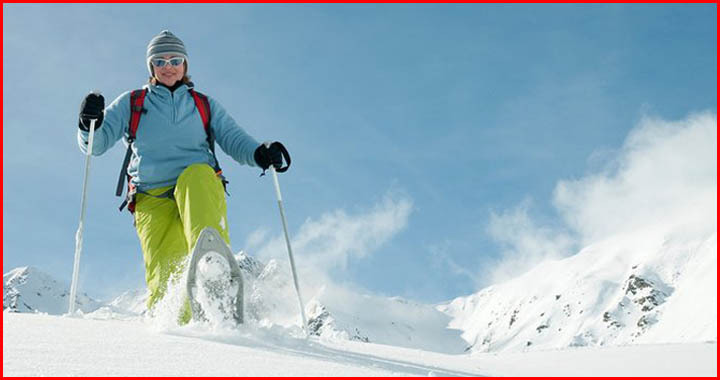 That includes learning about what to wear and what to bring in your first snowshoeing hike. Such is important because what you’ll be wearing out there on the trail may determine whether you’ll have a good time or not. With the weather keeps being uncertain these days, it’s always best to put on your outfit in layers. That’ll allow you to adapt to the changing conditions quickly, either by adding or removing a layer. Moreover, since you’re bound to sweat while snowshoeing (trust me, you will! ), you’d better arm yourself with base layers made of moisture-wicking materials. Generally, it’d be either synthetic or wool; never cotton. The latter is capable of absorbing sweat quickly but it takes longer to dry. When wet clothes meet chilly winter air, you’ll get yourself an uncomfortable cold feeling. Footwear: You can either wear waterproof hiking boots or winter boots suitable for outdoor use, like Sorel and Columbia. Check out these great boots! Waterproof hiking boots are ideal since they’re lightweight. Their soles are flexible too and the upper is often breathable, making them much more comfortable than winter boots. Winter boots are only good if the days are extremely cold or if you’re on a short hike. The removable insulation layers inside them are better at preserving warmth. The soles are stiff and they can be pretty heavy. I won’t wear them if I plan to be on the trail for long. Adjustable poles. When the going gets tough and steep, you’ll thank yourself for bringing them along. Remember to study the map before you set off. Make sure you can quickly locate the nearby resources such as the resorts, ranger stations, or even mountain huts. If you bring your smartphone, be sure to pack extra battery with you. Don’t forget to save the phone numbers of the nearby resources. Cellular service is usually scarce, especially if you break off trails, but it never hurts to have those numbers in your handheld. Last but not least, always inform someone where you are going, through what route, and how long you’re going to be there.